United Arab Shipping Company (UASC) recently announced the launch of a North Europe – US East Coast (NEU1) service as well as an order of 3,500 reefer containers. The new NEU1 service is part of UASC’s strategic global network to provide customers with worldwide transportation access and reach. The service consists of a weekly sailing making five direct port calls in North Europe to the principle ports of Le Havre, Antwerp, Rotterdam, Southampton and Bremerhaven and four direct port calls on the US East Coast Atlantic coast to the largest ports of New York, Norfolk, Charleston and Savannah. 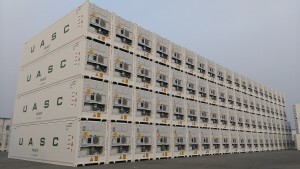 Following the recent delivery of 2,000 new reefer units, UASC announced an additional order of 3,500 reefer containers with reefer technology provided by Daikin. The order marks the second milestone in the expansion of UASC’s reefer services and reiterates the company’s ongoing investment in the most cutting-edge, energy-efficient solutions for the carriage of frozen and chilled cargoes.